Improve the quality of your legacy applications. PHP developers from all skill levels will be able to get value from this book and will be able to transform their spaghetti code applications to clean, modular applications. If you are in the midst of a legacy refactor or you find yourself in a state of despair caused by the code you have inherited, this is the book for you. All you need is to have PHP 5.0 installed, and you&apos;re all set to change the way you maintain and deploy your code! Have you noticed that your legacy PHP application is composed of page scripts placed directly in the document root of the web server? Or, do your page scripts, along with any other classes and functions, combine the concerns of model, view, and controller into the same scope? Is the majority of the logical flow incorporated as include files and global functions rather than class methods? 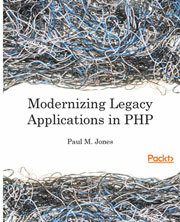 Working with such a legacy application feels like dragging your feet through mud, doesn&apos;t it?This book will show you how to modernize your application in terms of practice and technique, rather than in terms of using tools like frameworks and libraries, by extracting and replacing its legacy artifacts. We will use a step-by-step approach, moving slowly and methodically, to improve your application from the ground up. We&apos;ll show you how dependency injection can replace both the new and global dependencies. We&apos;ll also show you how to change the presentation logic to view files and the action logic to a controller. Moreover, we&apos;ll keep your application running the whole time. Each completed step in the process will keep your codebase fully operational with higher quality. When we are done, you will be able to breeze through your code like the wind. Your code will be autoloaded, dependency-injected, unit-tested, layer-separated, and front-controlled. Most of the very limited code we will add to your application is specific to this book. We will be improving ourselves as programmers, as well as improving the quality of our legacy application. This book gives developers an easy-to-follow, practical and powerful process to bring their applications up to a modern baseline. Each step in the book is practical, self-contained and moves you closer to the end goal you seek: maintainable code. As you follow the exercises in the book, the author almost anticipates your questions and you will have the answers, ready to be implemented on your project.